I love playing with new flavors and new techniques in the kitchen. For the past year or so, I have been experimenting with various gluten free flour options. I prefer to find ways to use the various flours in recipes that are made for them, rather than using the flours as substitutes for traditional wheat flour. A while back, I bought a box of chickpea flour on Amazon. I bought it for a specific recipe, but was left with three additional bags of flour. The price for the bulk flour made it worth it. 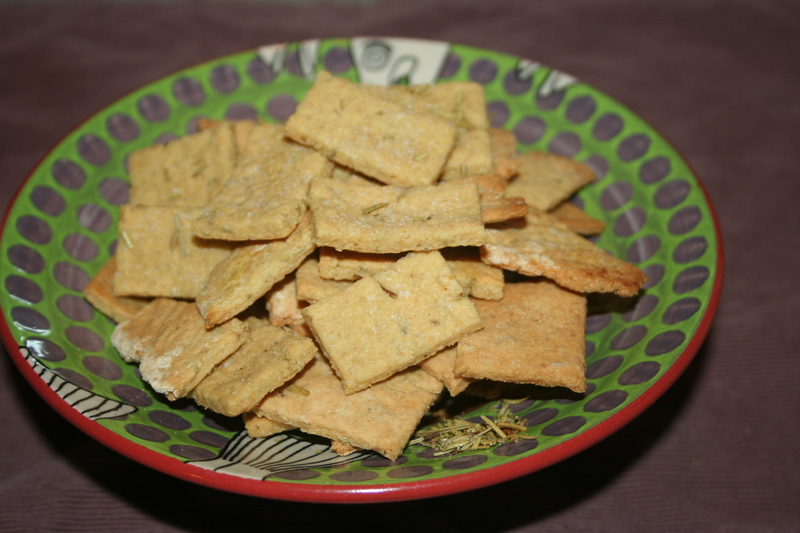 Most of the chickpea flour recipes that I have played with have been Indian recipes. While perusing the NY Times one day, I was excited to see another option – the Socca. Socca is a traditional French flatbread. It is chewy, soft and crispy around the edges. It pairs well with many flavors. 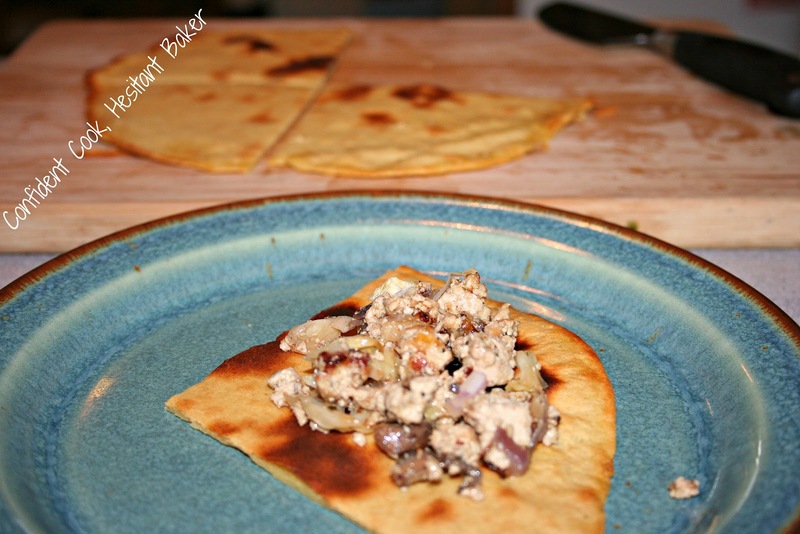 A recent dinner found us eating the socca with a simple mixture of crumbled tofu, onions and mushrooms. It really is versatile, so I encourage you to play with it. Mix everything together in a small mixing bowl. Set aside for about 30 minutes or so. Heat your broiler to high. Preheat your cast iron pan in the oven for a minute or two. Brush a thin layer of olive oil on your pan. Ladle a thin layer of the chickpea batter into the pan. 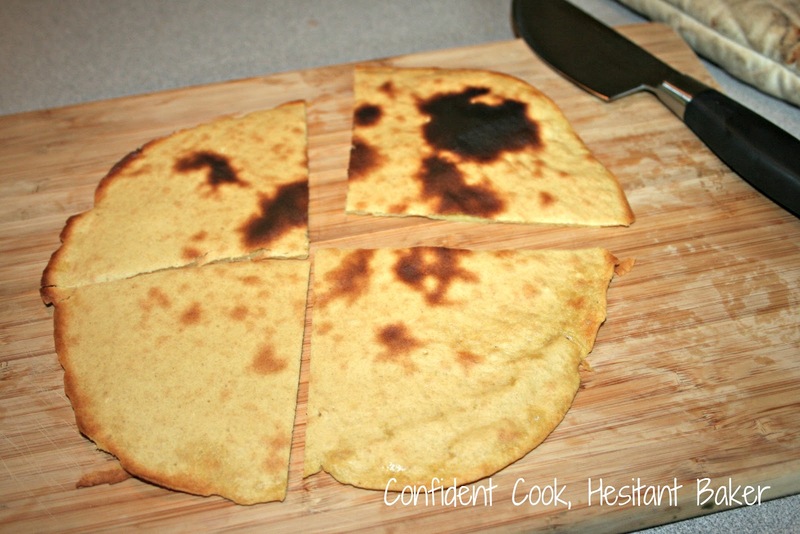 I used around 1/2-3/4 cup of the batter for each flatbread. The process is similar to making a crepe. Place the pan under the broiler for about 3-4 minutes. It will bubble and brown on top. Remove from oven and slice in to wedges. We served ours with a sauteed mixture of tofu, onions, garlic mushrooms and herbs. Enjoy with any toppings you’d like. You could even make it sweet and serve for dessert! This post is linked to My Meatless Mondays and Gluten Free Weekly Meal Plan.